(The prescription must include a min and max pressure for the Auto CPAP range. The SleepStyle™ 254 Auto CPAP with Humidifier offers a comprehensive range of standard, enhanced and truly integrated CPAP devices with Auto Adjusting of pressure based upon level of obstruction, usage recording capability and SmartStick Technology. The SleepStyle™ 254 Auto CPAP has an advanced auto-adjusting system designed to enhance patient comfort with Fisher & Paykel's SensAwake™ Technology. SensAwake™ senses when a patient wakes and promptly lowers the pressure to aid the transition back to sleep. The result is a more personalized therapy during sleep and awake states. The auto-adjusting algorithm detects and responds effectively to flow limitation, apnea and hypopnea as show below. The versatile Auto CPAP device can be used as a titration and long-term treatment solution for your patients. The flow-based auto-adjusting algorithm detects and effectively responds to flow limitations, apneas and hypopneas. Pressure increases in response to both central and obstructive hypopneas up to the same predetermined level programmed for apneas. Above this level the algorithm will continue to respond to obstructive hypopneas. The SleepStyle™ 254 Auto CPAP with Humidifier includes the Ambient Tracking™ Plus Auto-Adjusting Technology and Removable SmartStick Technology. The SleepStyle™ 254 CPAP offers SmartStick™ Technology along with a compliance metric and efficacy reporting. The SmartStick™ utilizes USB technology and provides convenient 2-way removable media to view and update settings. This SmartStick™ Technology combined with PerformanceMaximizer™ Software streamlines therapy analysis with options for compliance data with the SleepStyle™ 254 CPAP. * Two-way communication, including data transfer and remote adjustment of. Has ComplianceMaximizer software for CPAP and humidifier usage and performance data reporting for clinicians and providers. This version also includes efficacy (beneficial change or therapeutic effect) usage reporting. 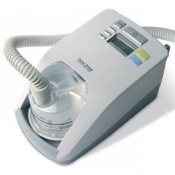 SleepStyle™ 254 Auto CPAP with Humidifier includes patient manual, 2 standard water chambers, connector, 6ft tubing, air filter, water funnel and carry bag.